Thanks to the tremendous intellectual efforts of the Founder of Creativity, Ben Klassen, Pontifex Maximus Emeritus, the first stage in establishing our Religious Creed has been successfully completed: The IDEOLOGY of our religion has been formulated and recorded in the three basic books and nine supplementary and numerous issues of Racial Loyalty. In order to fully appreciate the significance and magnitude of this achievement, we must remember that no other religion or ideology during the entire 6000 years of civilization came even close to Creativity as far as the survival, expansion and advancement of the White Race is concerned. However, even the best religion or ideology will remain ineffective without proper organization of its supporters and activists. Therefore, now upon completion of our Religious Creed and Ideology, we must enter the second stage in establishing our Religious Creed: We must create an effective ORGANIZATION to achieve the goals of our Ideology. While leadership in the first stage of our development by its very nature belonged to philosophers/ideologues. The second stage in establishing our Religious Creed calls for a new type of leadership — ACTIVISTS/ORGANIZERS. Also, while during the first stage of our development the main burden was carried almost single-handedly by our Founder, the second stage shifts the burden and focus of our activities to legions of grassroots activists/organizers not only all over the U.S., but also in every White country of this Planet Earth. At this point in history, the most important task and challenge facing Creativty is the overwhelming need for rapid, aggressive, massive expansion of our activities and organization at the grassroots level amongst the frustrated masses of White people. The time has passed when our supporters and members in the field could be passive beneficiaries of activities centered around the leadership of The Alliance: In fact, the time has come to reverse the trend and make sure that the main activities of our Creed are coming from the field to the headquarters, not the other way around. Also, we have to make sure that our Creed becomes a self-sustaining, self-supporting, self-renewing mass movement, able to withstand any and all attacks by our racial enemies, including the possibility of destruction of our leadership by enemy forces. 1. Where do we start? — Each Creator should start by becoming thoroughly familiar with the White Man’s Bible, subscribing to the Racial Loyalty newsletter and supporting The Alliance with regular financial donations. 2. What is the second step? — Each Creator should introduce our ideas, leaflets, newsletters and books to as many of his relatives, friends and acquaintances as possible. 3. What is the third step? — Each Creator should find at least one other sympathetic White person and organize a CHURCH PRIMARY GROUP. 4. What is a CHURCH PRIMARY GROUP? — CHURCH PRIMARY GROUPS are the basic organization of the Creativity Alliance. They consist of a minimum of two persons and an optimum of five to ten persons. Each CHURCH PRIMARY GROUP is considered to be an independent regional aspect of the Church of Creativity under the umbrella of the Creativity Alliance. 5. What to name a CHURCH PRIMARY GROUP? — Each CHURCH PRIMARY GROUP is to include the name Church of Creativity along with their regional designation to be selected by the PG Members with the approval of the National Office. 6. Who can organize a CHURCH PRIMARY GROUP? — Every Creator has a right and a duty to organize a CHURCH PRIMARY GROUP (or increase an existing PG) by converting at least one White person to the White Racial Religion — Creativity. 7. Who selects a CHURCH PRIMARY GROUP Coordinator? — Members of each CHURCH PRIMARY GROUP select a leader amongst themselves with the approval of the National Office. It is the responsibility of the newly selected PG Coordinator to liaise with the National Office and establish a Charter for the CHURCH PRIMARY GROUP. 8. Is there a cost in establishing a CHURCH PRIMARY GROUP? –There is an initial cost of $150 to establish your CHURCH PRIMARY GROUP and a levy of $100 per annum to maintain the Charter for your CHURCH PRIMARY GROUP. This entitles the PG Coordinator to a certificate which is held for the duration of the current PG Coordinator by the CHURCH PRIMARY GROUP, and the right to collect membership fees for the maintenance and expansion of the local Church. Upon change of PG Coordinator, it is the task of the new PG Coordinator to liaise with the National Office and establish a new Charter for the CHURCH PRIMARY GROUP. 9. What is the suggested way to resolve conflicts within a CHURCH PRIMARY GROUP? — Each member of a CHURCH PRIMARY GROUP can leave it and form a new PG. Like all living cells. CHURCH PRIMARY GROUPS have to grow, divide and multiply, yet remain within the same body – The Creativity Alliance. 10. How do we organize different CHURCH PRIMARY GROUPS? — CHURCH PRIMARY GROUPS are formed on a regional basis under the supervision of the National Office. Each PG is responsible for its own actions and no PG is senior to or holds authority over another PG. The National Office at the discretion of the Pontifex Maximus, may appoint State/Provincial/Regional Coordinators as deputies to the National Office. 11. Do we have a need for special purpose PRIMARY GROUPS? — Yes, there is a need for regional security. CHURCH PRIMARY GROUPS whose members are called the WHITE RANGERS. Other special purpose CHURCH PRIMARY GROUPS will be formed as needed. 23 Words: What is good for the White Race is of the highest virtue; What is bad for the White Race is the ultimate sin. Our Mission is to educate and awaken White Europeans and people of European descent everywhere, to the possibilities currently being kept from them by the tripartite oppression of the alien Judeo-Christian religion, Multiculturalism and Political Correctness. Our Vision is to build a Whiter and Brighter World. Also known as the Divine Symbol of Victory - (in Latin) Divinum Signum Victorie - the "W" in our insignia stands for the noble White Race. It is the 23rd letter of the alphabet. The CROWN represents our unconditional right to supremacy in Nature's realm. The HALO signifies purity of blood, and that we jealously regard our blood lines as the sacred value on the face of the earth. The shape of DNA - Nature's way of maintaining our White Racial Brotherhood - appears much like a spiral staircase or twisted ladder. The stairway's railings are composed of sugars and phosphates. When a cell divides for reproduction, the helix unwinds and splits down the middle like a zipper in order to copy itself. Be it Known: The Creativity Alliance has no affiliation with Matthew F. Hale, his defunct organization, the World Church of the Creator (WCOTC), or the group that claims successorship from the WCOTC known variously as The Creativity Movement (TCM) and Skinheads of the Rahowa, or its members or supporters. The Creativity Alliance strives to return to Creativity Founder Ben Klassen's vision of the premier Church of the Creator (COTC), pre-WCOTC, but without the liabilities concomitant. Be it Known: The Creativity Alliance has no connection whatsoever with any legal cases pertaining to Matt Hale and is entirely indemnified from same. The Creativity Alliance makes no more official claim to successorship of the COTC than can rightly be claimed by the WCOTC, TCM or any other assemblage that has attempted to regather Creators since the demise of the original COTC. Nevertheless, our Church of Creativity groups have just as much right as the aforementioned groups to keep the Creativity torch burning. 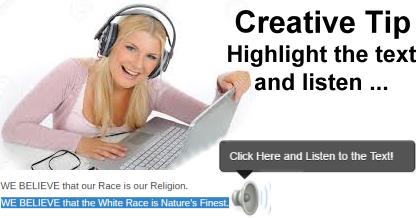 We of the Creativity Alliance will continue to practice our racial religion, and intend to spread it far and wide. Due to a 2003 decision in the US 7th Circuit Court Of Appeals, the name "Church of the Creator" is now the trademarked property of a Christian entity known as TE-TA-MA Truth Foundation-Family of URI®. Use of the name "Church of the Creator" in any context is presented for educational purposes only. The Creativity Alliance makes no attempt to assume or supersede the trademark. Trademark remains with the trademark holder. The Church of Creativity is a Professional, Non-Violent, Progressive Pro-White Religion. We promote White Civil Rights, White Self-Determination, and White Liberation via 100% legal activism. We do not promote, tolerate nor incite illegal activity. 1: It is the avowed duty and holy responsibility of each generation to assure and secure for all time the existence of the White Race upon the face of this planet.